In our office, we treat snoring and sleep apnea with a unique approach. For example, we can provide you with a home monitor to help you (and us) assess whether or not sleep apnea should be a concern. 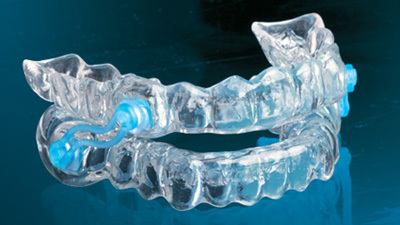 The gold standard for treatment of sleep apnea is presently with the CPAP machine. However, only a minority of CPAP owners are still compliant after one year. If you are one of the non-compliant, we can fabricate an oral appliance that will help open your airway and reduce the severity of your sleep apnea. These appliances reduce health risks associated with sleep apnea without the need for surgery, medications, or other therapies. A custom oral appliance worn while sleeping, holds the lower jaw forward and open, preventing the tongue and throat tissues from collapsing over the critical airway. Why Choose 21st Century Dental for Oral Appliances Treatment? 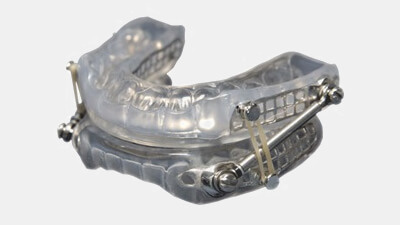 The SomnoMed MAS™ is a Mandibular Advancement Splint (MAS) that treats both snoring and obstructive sleep apnea (OSA), by advancing the lower jaw forward. 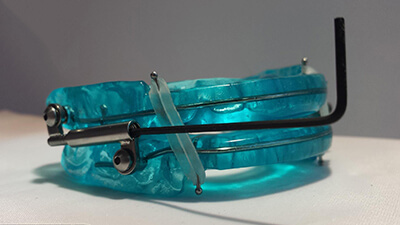 It is a custom-made device consisting of upper and lower dental plates with a unique patented fin-coupling mechanism. If required, a component can be added to make the device adjustable. This feature provides incremental and adjustable levels of jaw advancement, which improves the effectiveness and comfort-level of treatment as the jaw is moved only as far as is required to alleviate snoring and reduce OSA. Patented Optimized Retention of the Mandible (ORM) articulation promotes mouth closing and physiological breathing during sleep. The Moses appliance (designed by Dr. Alan Moses) has a unique design that actually encourages the tongue to move forward into the opening you see below. 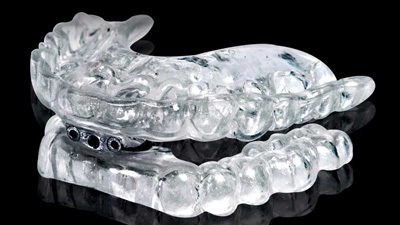 When added to the adjustability of the mandible, and when a bite is taken that incorporates a vertical opening component, this newcomer to the sleep market shows great potential. 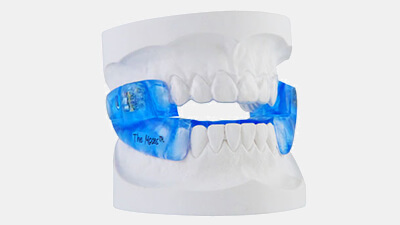 The SUAD appliance allows more lateral movement than most other oral appliances and is specially made for our patients who enjoy grinding their teeth at night (you know who you are). The thermoflex material usually requires heating in warm/hot water to soften it enough to place it every night. 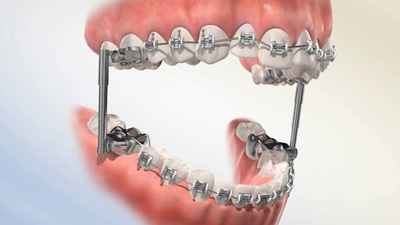 It also comes with a Morning Repositioner, used for isometric exercises (clenching on bicuspid area) for 15 minutes in the morning to help the bite return to normal. The OASYS Oral/Nasal Airway System is another popular appliance and the first dental device to be reviewed by both the dental and ENT divisions of the FDA and approved as a dental device for treatment of snoring and sleep apnea through mandibular repositioning and also as a nasal dilator for reduction of nasal resistance and improved nasal breathing. To understand the way the dilator works, close your lips and hold your teeth together while breathing slowly through your nose for several breaths. Now, allow air to fill your upper lip and try the breathing again. Notice how much easier it is to inhale? This is why the OASYS is designed this way. The Herbst appliance has been used in the orthodontic field for many years to encourage the lower jaw to move forward during growth. Its place in the sleep market is not too different. 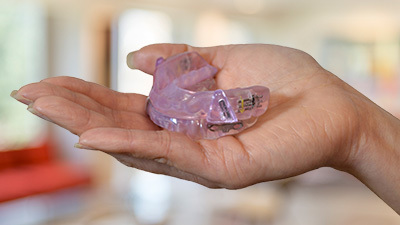 However, instead of being used during growth, it holds the mandible in a forward position to open the airway, as do most of the appliances designed to help sleep apnea and snoring. Its advantages are its simplicity and long-term place in the dental arena. Another "mandibular-repositioning" appliance we use is called the Thornton Adjustable Positioner (TAP®) oral appliance, which is a mandibular advancement device composed of two separate arches (maxillary and mandibular) containing an advancing mechanism which permits unlimited advancement of the lower jaw. The arches are custom fit to a patient's models. The advancing mechanism is engaged and the screw mechanism in the upper tray is then turned to advance the mandible until the patient begins to feel any discomfort in the temporomandibular joint or in the facial muscles (maximum mechanical protrusion, which is an average of 2.5mm beyond maximum protrusion). The advancing screw is then turned back until the patient is comfortable. 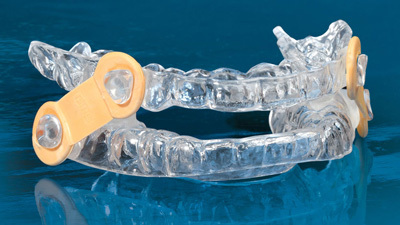 The SILENT NITE® device does not interfere with breathing through the mouth and is one of the more comfortable designs. It is not made for severe grinders, but it is a comparatively small device with tiny connectors attached to transparent flexible upper and lower forms. 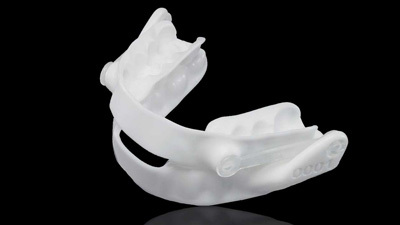 Another mandibular-repositioner is the Silencer Professional, a laboratory fabricated, fully adjustable oral appliance. The appliance features a titanium precision attachment, which controls the anatomical settings of the appliance. It is capable of anteroposterior adjustment as well as vertical adjustment through a range of 10mm in both dimensions. The design of the precision attachment also allows lateral movement of the mandible, which respects and protects the TMJ. Another type of appliance is the Tongue Retaining Device. The "TRD" is constructed of a flexible polyvinyl material adapted to the general contours of the teeth and dental arches. It does not depend on teeth for retention. Rather, the tongue is held forward by the negative pressure created in the vacuum bulb on the front of the appliance. A less complicated version of a tongue-retaining device is the AveoTSD, or "Tongue Stabilizing Device." The aveoTSD is made from a soft medical silicone for comfort and works by holding the tongue forward by gentle suction, preventing it from falling back against the back of the throat and keeping the airway open during sleep. According to the company, the TSD is ideal for edentulous patients, temporomandibular joint (TMJ) indicated disorders, large tongue problems, complicated dentition conditions, periodontal problems, and children. Unlike the other devices, the aveoTSD does not attach to the teeth but acts much like a pacifier instead. Don't worry – we won't tell if this is what you decide to use. These are currently our favorite appliances, but this field is still in its relative infancy and more appliances are being invented and/or awaiting FDA approval all the time. We treat each patient individually, so we might suggest a specific appliance for you but a different one for your spouse. Whether snoring that has forced you into a life on the couch or there’s a more serious apnea problem present, please call or schedule an appointment today in Las Colinas to discuss your condition!